I'm going home today! I'm so excited to rest and relax. These swelling feet of mine could use a break. I bought a new book (The Hunger Games) to keep me occupado on the plane. I've heard it's good and I'm depending on it to distract me while in the air cuz I HATE FLYING. 92 degrees tomorrow? Yikes! 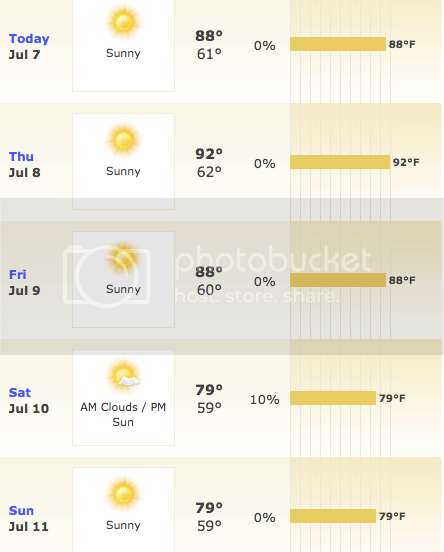 Good thing Allie and I are planning to hit the city where it will be a little cooler. But when all is said and done, nothing compares to a sunny day in Washington. Nothing. The beauty is incomprehensible. Posts from Washington are coming for the next few days, woohoo! PS - I've reached a big milestone today - only 100 days left 'til Fox makes his debut! That means tomorrow we're down to double digits!!!!! I'm gonna miss you, love! Only 100 days to Fox! Woo hoo!!! yay! have fun in wa and congrats on only 100 days left!! I'm so jealous! we go up at the end of July and I can barely stand waiting! HAVE FUN! And wow... almost to double digits! How exciting!! oh my goodness hunger games is so good!!! my mom is flying in tomorrow and that's what book she'll be reading on her flight too! line up catching fire for right when you finish because you'll definitely want it! have a fun trip!!! you will LOVE hunger games! I just finished the second one! Yeah for Washington! A sunny day here is probably the most beautiful, BUT with no A/C the nights can be the worst. I am going to Portland this weekend or I would try and meet up! How long are you in town? !